Looking to keep that original look or not give away what you are running from first glance? Butler Performance now offers the service to have all logos removed from aluminum cylinder heads. We can remove logos from the end of the cylinder heads and above the exhaust ports. This service leaves the heads with a sleek, clean look and ready to paint for that original OEM look. We can even paint the heads for you in any of the colors we offer including exact paint matches for many Pontiacs. The Stealth Option is available on all of our BP Custom Cylinder Heads or ask a sales person to add to Edelbrock out of box heads. We offer these same stealth options such as logo removal ($50) and paint to any of our aftermarket intakes as well. Take a look at a few recently completed Stealth cylinder heads. 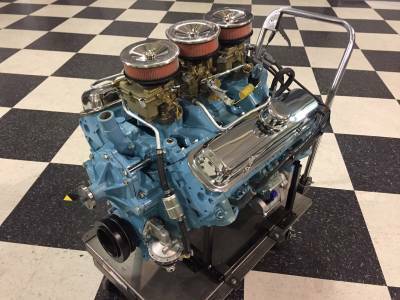 Check out this awesome restored engine from Butler Performance. 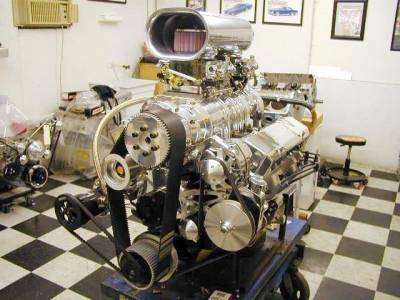 This engine is a nice example of many of our builds. As you can see in some of the pics it came to us exactly as you would expect a 40-year-old motor. Tired and rusted and the heads were in the same shape. Many would look at this and think there was no hope, but not us. We see potential Pontiac Power. 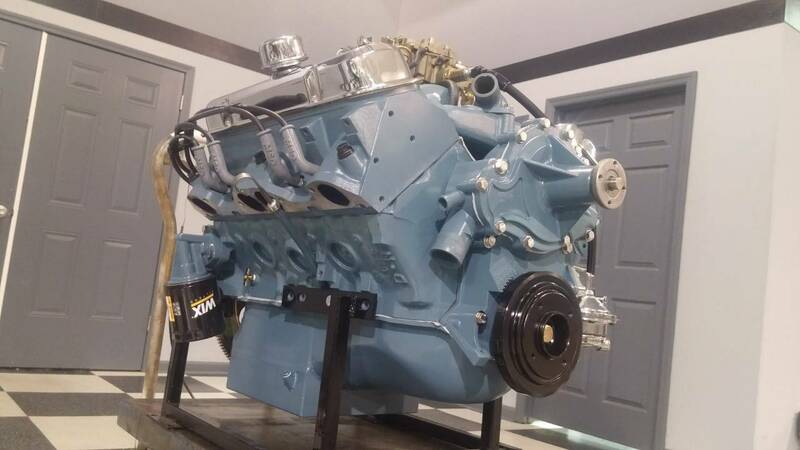 We had the customer's engine shipped to us and the parts were inventoried. What was usable was saved. We use what we can but replace the parts that need to be replaced after 40 years. We then put the block and heads through what we call "The Butler Process". 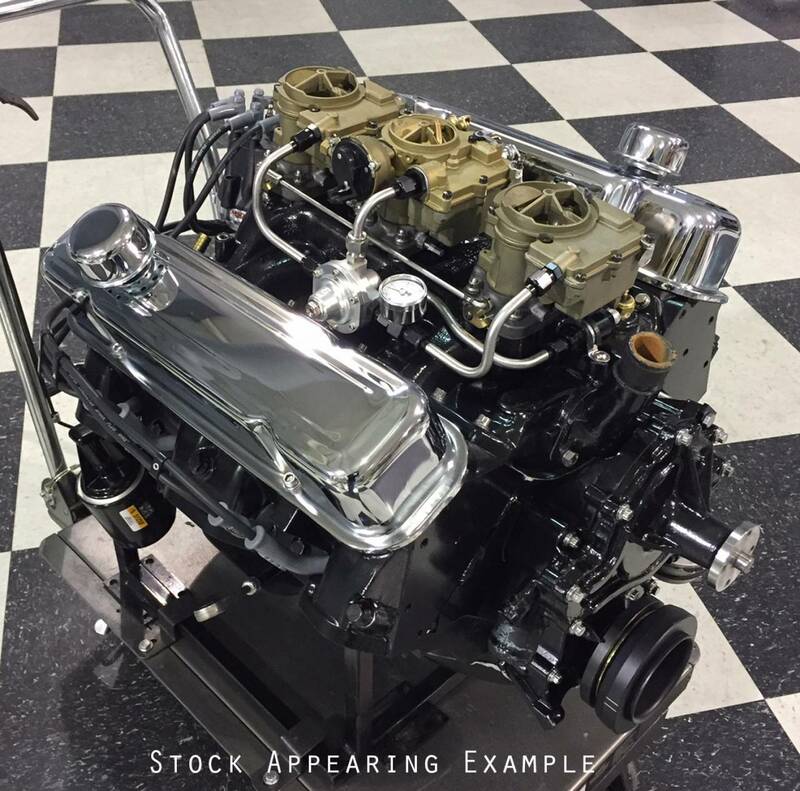 This process is our tried and true method of combining the old block and heads with the proper machining, quality performance parts, and meticulous assembling by experienced, professional engine builders. We then dyno test to ensure the performance meets our expectations. 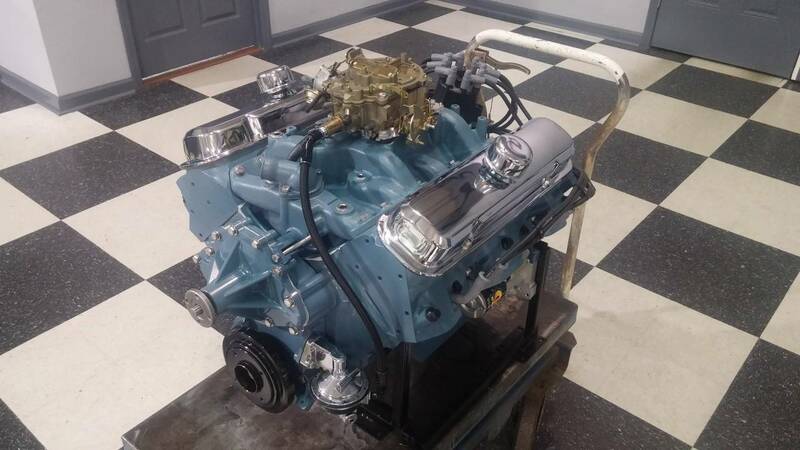 In this build, we took the customers 389 block and bored and stroked it to a 453 cu.in. We specialize in stroking 389's, 421's, 400,s, or 455's up to 500 cu.in. and keep that stock appearing look. The compression ratio was lowered to 9.4:1 for pump gas. Here the customer opted for porting the cast iron heads. Some choose aluminum heads where we remove all the logos and paint match it so it gives that factory original look that is hardly noticeable. As you can see in the pictures, the block and heads are tested, cleaned, machined, blueprinted, cleaned again for paint, painted, then sent up for assembly and building. During assembly, each step in our process is done with precision and consistency. We upgraded this build with a Butler/Comp Hydraulic Roller Cam with Lunati Hydraulic Roller Lifters. This eliminated the need for oil additives and gives it more longevity and better wear characteristics with less valvetrain noise. We then added a fully restored Tri-power set up. Once the assembly is finished we then move to the dyno. This is where we engine goes through the break-in and is put it through a series of performance runs. With each run, we tune to get the optimal results. So here it is, a beautifully restored Pontiac Tri-Power that is leaps and bounds above what came off the assembly line. 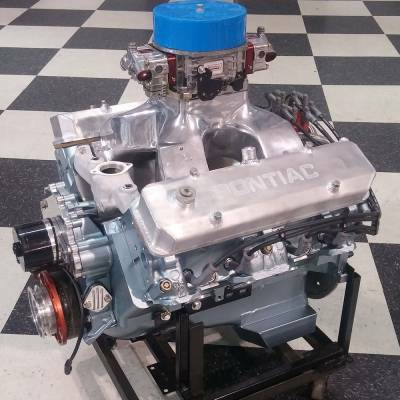 650+ HP Pontiac 400/487 cu.in. 820 HP and 860 ft/lbs of torque (at only 3800 RPM!!!) and on pump gas! 535 cu.in. Butler Performance Pontiac with a BDS 8:71 blower, CNC ported Edelbrock heads, BP/COMP custom hyd roller cam, and FAST XFI. We also added a full serpentine belt system with all accessories including AC. 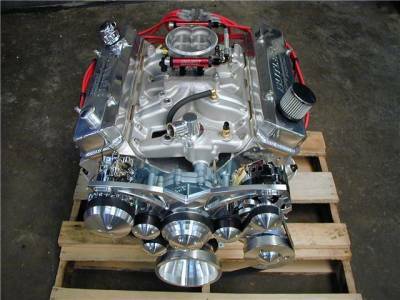 This is going in Tom's 1965 GTO with a Tremec 5 spd. 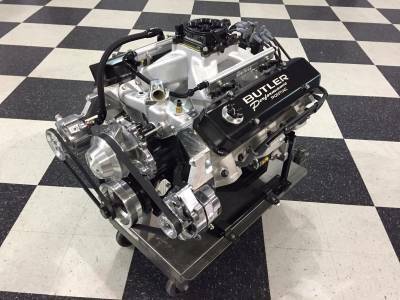 Butler 505 Complete Engine producing 1000HP on pump gas. 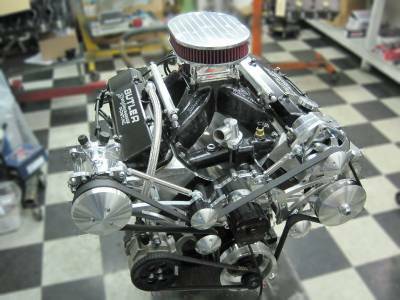 Features Butler/Edelbrock CNC Custom Heads. This is a Hydraulic roller street engine with all the accessories and A/C. Includes polished parts for a unique look with a March Style Track system. This is just the start of this twin turbo engine. It produces 1400HP when the boost is turned up and running on race fuel. This is a beast of a "street" engine. 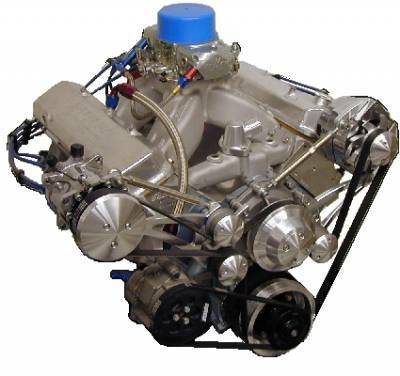 Butler 461 Complete Engine with a FAST EZ-Fuel & Spark system. 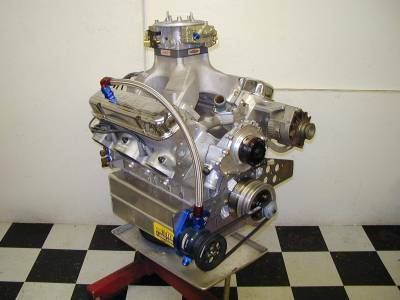 Eagle and Ross rotating assembly with BP/Edelbrock CNC Ported 87cc Round Port Heads. The "Black Onyx" Style track system was a perfect match with the black BP valve covers and Fast EZ efi. Hp range is 500-600 depending on cam specs, intake choice, etc. 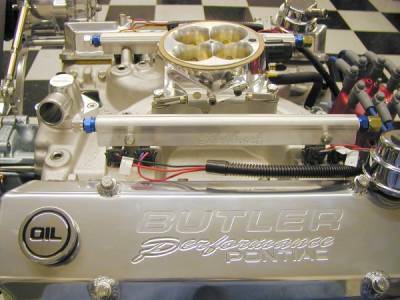 Butler Performance custom builds Pontiac engines to your specifications. Whether that's an all out race engine, perfect street engine, or something in between! Let us know what you want and we can build it! Butler Performance 461-474 c.i. Crate Engine with Accessories. Starts at 500 HP and 550 ft.lbs. of torque. (Up to 600 + HP on Pump Gas) Many custom options available. 487-501 c.i. Engine 580-600 + HP 600-625+ tq. 700 HP & 700 ft/lb. STREET Engine on PUMP GAS !! 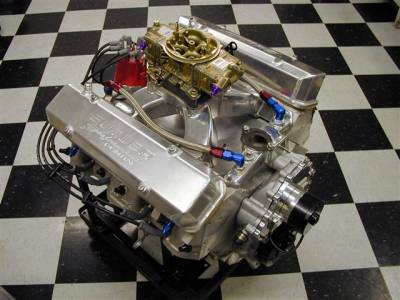 BUTLER PERFORMANCE introduces the ULTIMATE PONTIAC STREET ENGINE !! 700+ HP and 700 ft.lbs. Torque - PUMP GAS AND HYD. ROLLER CAMSHAFT !! 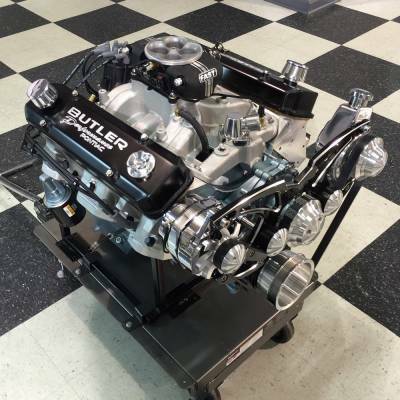 Butler Performance 535 cu.in. 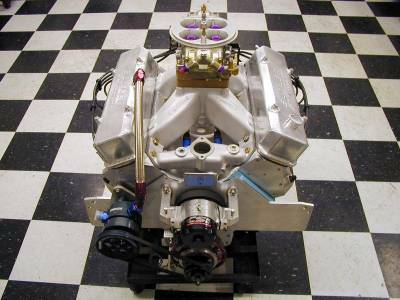 engine w/ IAII Block and our CNC Race Ported Edelbrock Heads ( std. port version ). This engine features a very PUMP GAS friendly 10.9:1 c.r. and a Butler Performance custom ground Hydraulic Roller cam for excellent, drive it anywhere streetability- and very low maintainence, just drop it in and enjoy! 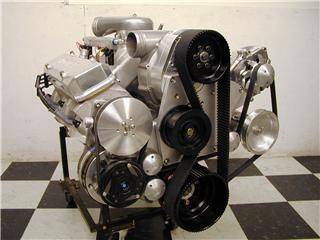 We offer several options with these engines including various valve covers, paint colors, pulleys and accessories, nitrous, EFI, etc... We even have a combo that will fit under a stock Trans Am Shaker! 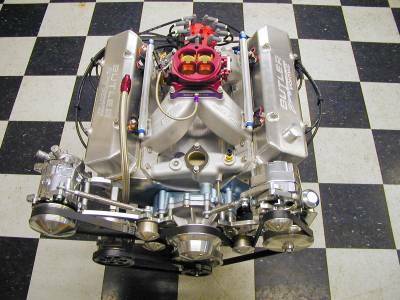 If your not in the market for a complete, turn-key engine from Butler Performance, or you have some parts of your own (block, heads, intake, etc. ), then we can sell any part of this 700+ HP combo in KIT FORM. 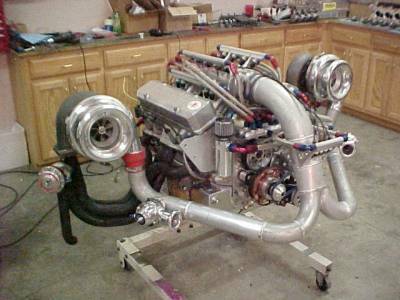 We do a COMPLETE Unassembled Engine Kit with EVERYTHING you need to assemble this engine yourself, or we can do a Shortblock Kit, Top End Kit, Etc. 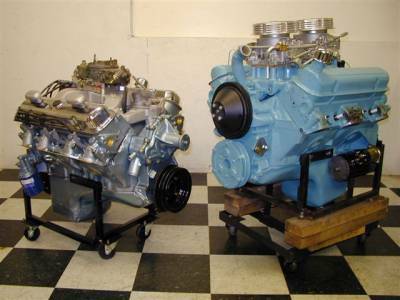 We"ll gladly work with your local machine shop or engine builder(including yourself if your the builder) if you want to have some of the work done close to home. Call or email for more info and a detailed price list. And remember to ask us about our flexible payment options. 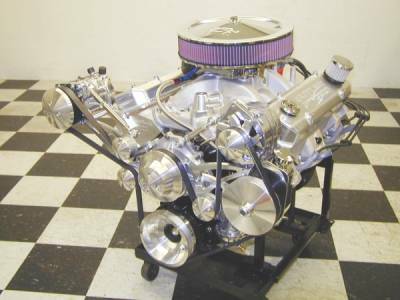 8.71 BDS blown 474 cu.in. Pontiac 455 pushing 711hp on Pump Gas! 8:71 BDS blown Butler Performance Pontiac on the dyno. 474 cu.in./455 block, very mild HYD ROLLER Cam, 8:1 c.r with 7 psi boost on pump gas. Made 711 HP and almost 700 ft/lbs torque! Should make a fun little street cruiser... with the AC on! 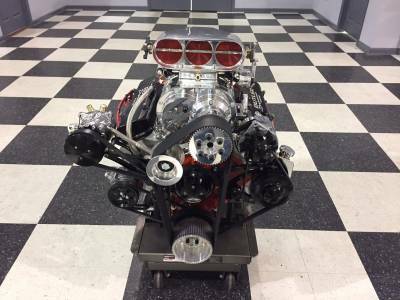 805 HP on PUMP GAS (NO NITROUS) with a March Serpentine System modified for use with an electric water pump and a crankcase evac pump. 461-474 c.i. 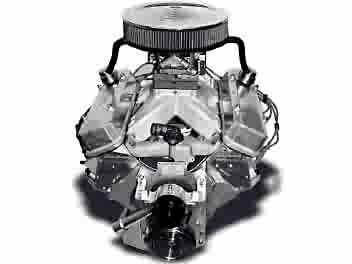 Pontiac Crate Engine with EFI. 525 - 625 + HP / 550 - 600 + ft.lbs.torque. Completely tuned and ready to run from Butler Performance. 461c.i. 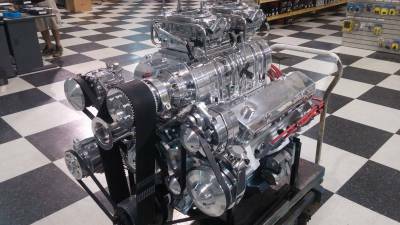 Pump Gas Pontiac EFI Street Engine 620 HP & 600 ft.lbs of Torque w/o nitrous! -- 780 HP & 835 ft.lbs. of Torque w/nitrous !!! 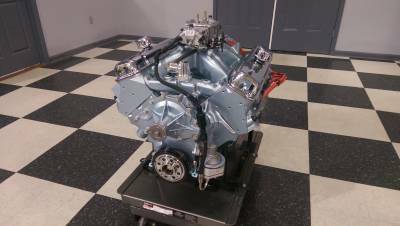 CNC wideport Edelbrock heads, bracket race reliability with heads-up power! 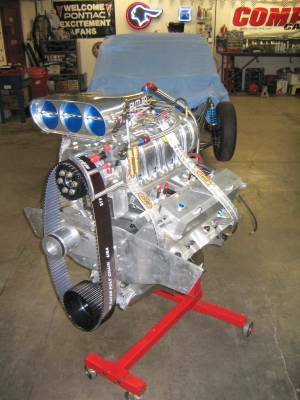 click HERE for more info on this engine and the car it is installed in! 537 c.i. 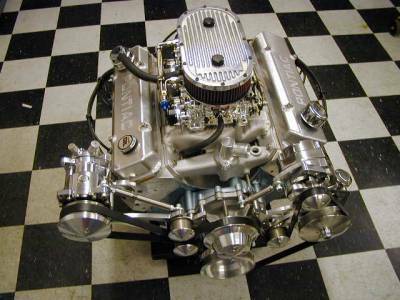 Engine w/Butler Performance Aluminum block and Tiger Heads. BOP Intake. 950 HP and 765 ft.lbs.torque. For Limited Street/Race. 900 HP on 92 Octane PUMP GAS !!! 489 c.i. Pontiac Street Engine w/ F1R Procharger and ALL Accessories. 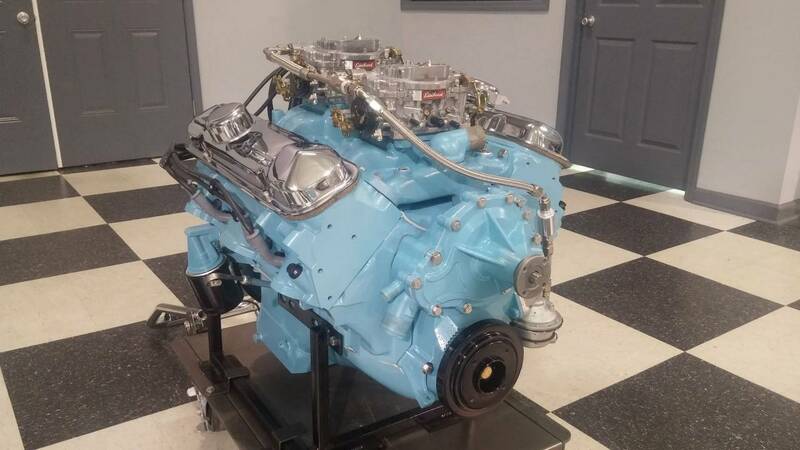 A Butler Performance 535 cu.in Pontiac engine producing over 650 HP on pump gas!! 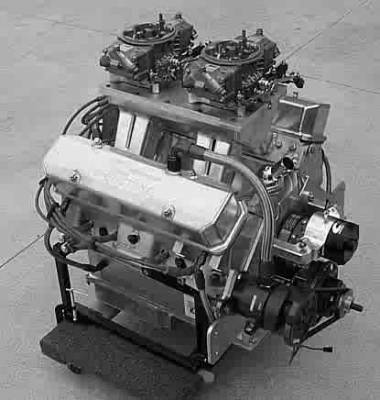 This engine is featured in the Burt Reynolds Edition Trans Ams. Butler Performance 461-474 c.i. Crate Engine with Edel. Lowrise 2x4 intake and 2 Edel. carbs. Starts at 500 HP and 550 ft.lbs. of torque. (Up to 600 + HP on Pump Gas) Many custom options available. 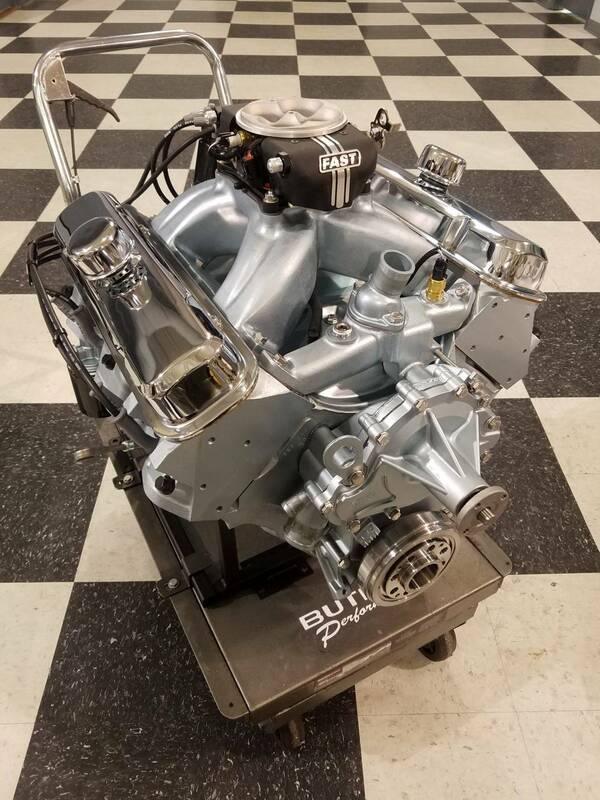 Butler Performance 499 cu.in. with an IAII block. 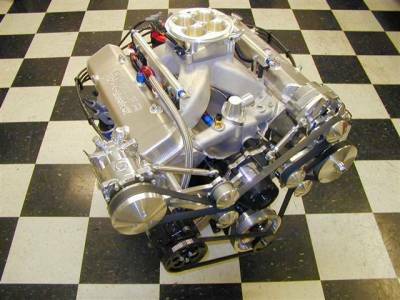 This engine features highly modified (by Butler Performance) RAIV heads. 820 HP @ 6800 RPM- 650 ft.lbs. of torque. 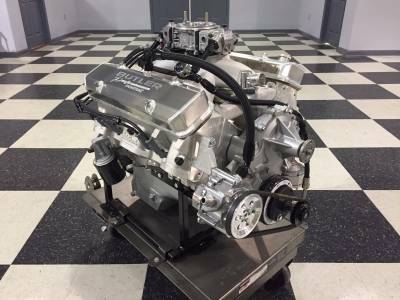 ( 4.375" Bore x 4.150" stroke ) Butler Performance has a PONTIAC Engine combination for ANY application! 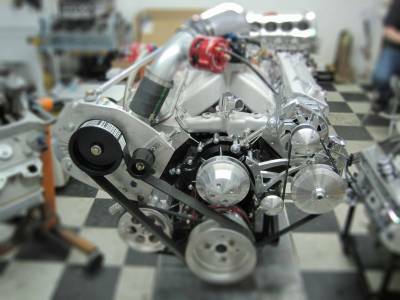 Justin went with a machined, balanced engine combination that he assembled himself, which was a 482 c.i. 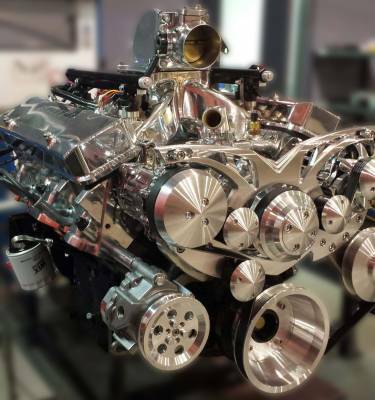 IAII block, balanced rotating assembly with BP/ROSS custom turbo pistons, BP/ Edelbrock CNC ported heads, custom valvetrain, and other street car stuff!!! 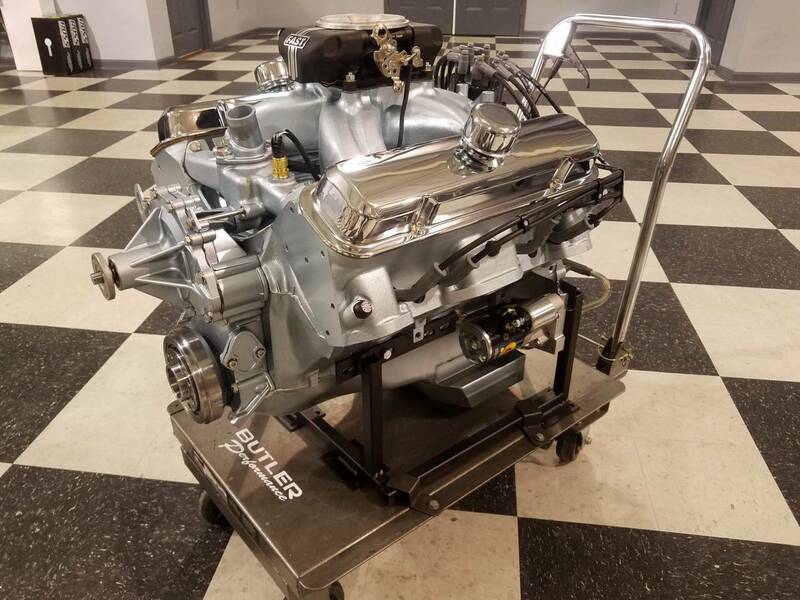 We do stock appearing and rare factory engines, including 389 Tripower, SD421, RAII, RAIII, RAIV, HO455, SD455, and RAV We can internally modify(strokers, head porting etc.) 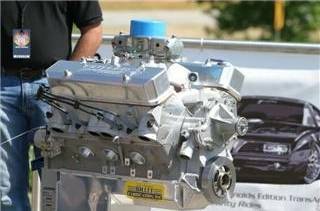 any of these engines to greatly improve power and durability while maintaining a totally stock appearance. Using our CNC wideport Edel. heads! 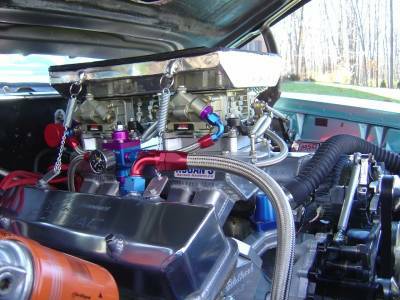 (NO NITROUS) NOW THAT'S PONTIAC POWER!! 489 cu.in Blown Butler Performance Pontiac. 14:71 Blower, IAII block, Tiger Heads. 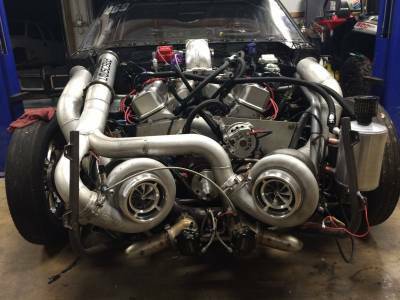 1600 + HP ! !